I recently read an article by Marsha Holton, CCRN, RCIS, FSICP, “An Ergonomic Survey of Cath Lab Repetitive Stress Injuries,” who observed that the duration of manual compression may be one of the ergonomic risk factors for cath lab repetitive stress injuries. As a result of her survey, Ms. Holton encourages cath lab professionals to look for ways to reduce the risk of injury. For those who are looking for ways to reduce the duration of manual compression, I recommend using the Safeguard Pressure Assisted device. The Safeguard Manual Assist (SMAT) study—a multicenter trial of over 100 patients found that the device was effective in reducing active compression time. Safeguard is indicated in the reduction of active compression time in femoral artery cannulation following diagnostic and interventional procedures and it is effective in obtaining and maintaining hemostasis. It has a clear polyurethane window and bladder with adhesive backing and a Luer valve for inflation with a syringe to provide pressure to the puncture site. 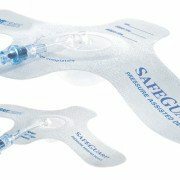 To learn more about the Safeguard Manual Assist Technique, contact your local Merit Medical Sales Representative. Each Merit PD catheter, sold separately from the implantation kit, includes a sterile implantation stencil to promote placement accuracy and better PD catheter outcomes. 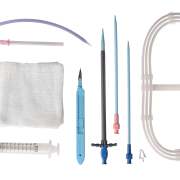 In addition to these kits, Merit offers a number of interventional tools to assist in these procedures such as the Merit Laureate® hydrophilic guide wire and MAK-NV™ non-vascular micro puncture sets. To learn more about these kits, visit our PD product web page or contact your local Merit Sales Representative. A survey conducted by Merit Medical found that radiologists, cardiologists, and vascular surgeons use, on average, two or more different endovascular snare devices in their practice. These physicians understand the importance of having options when a foreign object such as an IVC filter, stent, balloon fragment, broken catheter tip, or guide wire tip needs to be retrieved from the vasculature. Merit Medical recognizes this need and is pleased to be the only provider of two snare systems: an interlaced triple loop device–the EN Snare® Endovascular Snare System, and a single loop snare device–the ONE Snare® Endovascular Snare System. The EN Snare® and the ONE Snare® go hand-in-hand to provide physicians with the necessary options they need to meet any clinically-challenging case that may arise. Check out our website to learn more about the suite of Merit Endovascular Snare Systems. 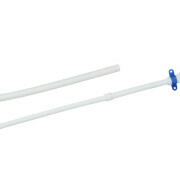 The Merit Medical CentrosFLO long-term hemodialysis catheter’s self-centering split-tip design has a greater separation between the arterial and venous tips than the symmetric-tip designed catheter. Its design is intended to optimize catheter patency and reduce fibrin sheath formation, thrombosis and vessel wall occlusions by keeping the tips of the catheter centered in the vessel and away from the vessel wall. In May of 2013, a retrospective study was completed by Dr. Saravanan Balamuthusamy (“Dr. Bala”) at Angiocare, Vascular and Interventional Nephrology, in Tucson, Arizona. The performance and safety of a new self-centering, split tip hemodialysis tunneled catheter was compared with a symmetric-tip catheter in 58 patients. The study results indicated that the CentrosFLO self-centering, split-tip catheter had statistically greater patency after 3 months with similar clearance and blood flow. 1 Study data on file. 2 Mean value during the three-month follow-up period. 3 Mean clearance and mean blood flow did not include data from patients with no catheter patency. 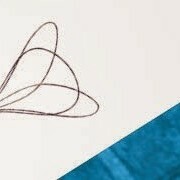 4 NSD = Not Statistically Significant, p > 0.05 (t-tests). For a full published version of this study, contact your local Merit Sales Representative.